This gallery installation was shown in Boston, MA during the SOUNDSCAPE 2007 show. The project overlays New York City with a proportionate amount of violence and destruction in real-time as that of the the people of Baghdad. Two digital cameras [in NY] sent a real-time panoramic image of NYC to the show in Boston. 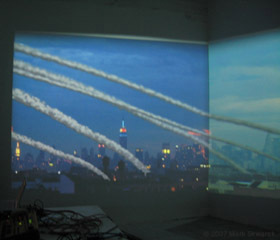 The video streams were augmented with real-time explosions and trailing smoke. The explosions and trailing smoke are dictated by information parsed from the Internet related to violence in Iraq. The piece is a grim reminder of the death and devastation the Iraqi people face on a daily basis in the wake of America's misguided invasion. Baghdad Skyline transforms New York City into a war-torn battle ground that parallels Baghdad. The aim of this piece is to increase awareness of the daily violence faced by the Iraqi people. Conceived of and physically installed by Mark Skwarek, the piece was programmed by Joseph Hocking, with Felix Lu creating graphics and Damon Baker contributing as an advisor. New York City was chosen because of its location and charged historical ties to the Iraq conflict. New York City, as a project site, lets Americans see their own land under constant attack. The horrific events which took place on September 11 left everlasting wounds in the hearts of New Yorkers and the rest of the world. Sadly, these tragic events were intentionally manipulated and used to lead America to war. Baghdad Skyline hopes to serve as a reminder of the consequences of our nation's actions and the daily horrors faced by the people of Iraq. The piece was an example of networked augmented reality running real-time, with a 13 second refresh rate. Two digital cameras were used to take frame captures of Manhattan which were uploaded to the Soundscape show in Boston. Augmented explosions were added with the video game engine Blitz3D. For more information about the piece visit the project's website, or go to SOUNDSCAPE.